For those making travel plans, know that fruit and veg pass successfully through airport security, even for an international flight. Place them in Ziploc bags in your carryon. 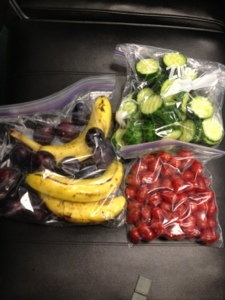 I have some Oregon plums, bananas, cucumber, and grape tomatoes. The key is that they are visible.